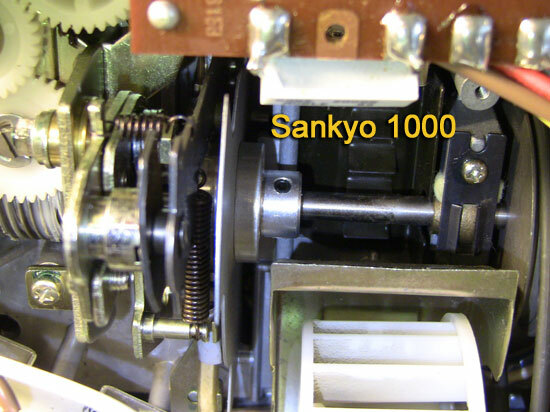 If your Sankyo has the jitters or film jams while threading in the gate... adjusting the claw can often be a solution. 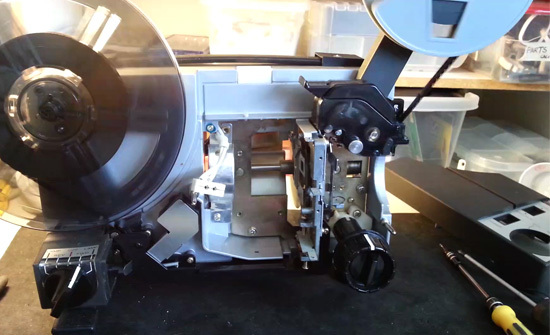 Access to the main drive shaft and the shutter is very easy on the Sankyo 1000. ... but access is not so straight-forward on the 2000H. The drive shaft is buried behind wires...a PCB...and a metal shield. Unless you are willing to dismantle these items (which I wasn't) moving them to gain some access room seemed a better option. You must carefully pull the wires back and remove the screw securing the PCB. Then there is a metal guard plate you will have to bend back to insert a long driver with an allen wrench head. You will probably want to remove the lens and lens holder to gain better visablity of the claw. Yes...a lot more work, but this gives much better adjustment control and visibilty. Loosen the grub screw with an allen wrench. 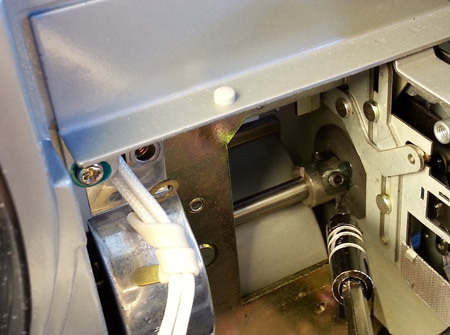 This allows sliding the shutter/claw assembly along the main drive shaft. I found it easier to control small movements by putting a screwdriver through an opening behind the gate... moving the shutter assembly with light tapping and then observing how much the claw protrudes after each adjustment. I have a Sankyo ST-800 with this problem, so maybe this will be useful for me. I just have to wait till I know I will have time to break down the projector and work on it. Thank you so much for taking the time to post this valuable information, with great pictures. James...I checked my pitifully non-working Sankyo ST-800 and the good news for you is that you won't have to do any dissasembly to adjust the claw. There is plenty of room to access the grub screw from the back of the projector. Have fun! Janice, this sound exactly what I need to do. However, do you think you could explain in a little more detail about the actual adjustment? 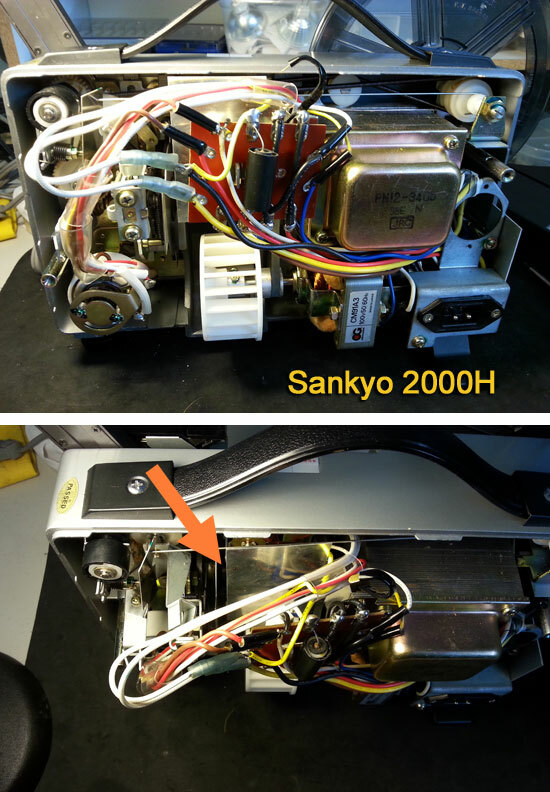 (in a Sankyo 1000H) after undoing the grub screw, where is the claw section from there? what am I actually looking for? (because I don't know what a correctly aligned one looks like having never opened a projector up before) and what kind of adjustments do I make to the claw section, with what tool, and how? I can see most of your 'posters' are familiar with the inside workings of the projectors, I'm not, but I can follow step by step direction well, and am careful and methodical. So if you could give me a step by step, that would be great. 1. From the back, undone and taken out one grub screw with an allen key, and loosened the second - though haven't taken it completely out. But still I can't see where the claws are, if there's anything wrong with them or what might be done to adjust them. Ready and waiting....sorry for all the dumb questions - but this is quite fun. From your OP this sounds like exactly the problem. Noise, jitters, then stuck. Jenny...There is only one claw. The claw arm is located right next to the shutter on the shuttershaft. 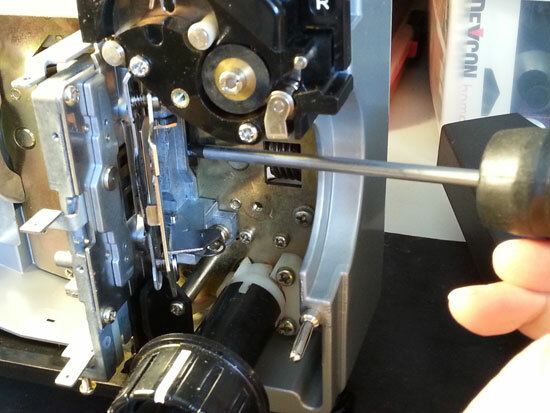 When you loosen the grub screws on the shaft you can move the shutter and claw assembly to the right and to the left. Moving to the left makes the claw protrude further into the gate and the film sprocket holes. Moving to the right the claw retreats further back in the gate towards the shutter. This is a trial and error adjustment that took me a very long time to master. I can't really give you step-by-step instructions, but here are the instructions I used provided by Dogtor Frank in another thread. I still think this type of adjustment is best attempted once you have more experience with projectors. It involves loosening the 2 hub grub screws with an allen key tool and carefully sliding forward the hub till the claw protrudes about 1mm past the aperture plate when it is in the maximum out position. That should be enough to ensure good penetration into the film. When you think you have got it right, slowly hand rotate the shuttershaft to observe the claw retreating and ensure it completely retreats from the film before it moves up for another frame grab. It must be seen to go below the aperture plate, where its safe to move up for another grab at the next waiting film frame. Test with a piece of old film when confident, by hand turning it over. Observe the location of the claw tip within the film sprocket hole, especially with Super 8 film which has a very small sprocket hole. It must be exactly central in the hole or it may cause an unsteady picture if it touches the sides. There is an adjustment for sideways claw-tip relocation if needed. Often it means moving the side film guides a tiny bit. On the Sankyo 1000, I usually remove the lens holder and lens to provide better visibility of the action going on at the claw tip. Before you make any adjustment changes, always look at the claw finger to see if a fluff ball has formed on the tip. This buildup of hairs and fluff happens to all projectors and will eventually prevent the claw finger from penetrating the film properly. Then the film jumping begins. So inspect and clean the claw tip and gate rails before making any changes to the claw settings. Good luck with the adjustment if its required. Take it nice and slow. Use good lighting and magnifying goggles. Be prepared for a number of attempts to get it optimal. Let us know how you go. I have removed the lamp and big plate over the heatsink, and removed the lens and lens housing, but I still cannot see the claw protruding/retreating when I rotate the shutter. Could it be broken off ? Oh - oh - found it. I took off the heatsink plate again, which I'd had off previously to remove the glass which I had found to be quite 'branded' with specs of something and uncleanable, and then I pushed the still-film-frame arm down and I found the claw arm. And it does seem to be moving up, protruding, moving down, then retreating smoothly. Next I have to see if it's protruding what seems to be proper amount. Appears that I have fixed my Sankyo 1000 jitters - HORAAH ! Followed the various threads' instructions for the back loop former; put a bit of a itsy bend in the copper strip under the take-up reel shaft but also put a bit of white grease on it; removed the heatsink glass and cleaned out all the guk and crap on everything which gave me a brighter sharper picture and eliminated two vertical shadows; and checked over the claw operation and ran a film thru to watch it work which seems to be working proper to me. I ran a test film transfer thru after that and it looked to go great ! The only thing not sure about is the neoprene belt that drives the shutter - flaps at the top as it goes around, but I don't think it is slipping. Anyways, thanks Janice and the others for the help. I am breathing a huge sigh of relief tonite. Steve...as good as the Sankyo 1000 is...the Sankyo 2000H is all around better. The primary advantage is that it uses a 100W EFP lamp. This makes it economically well worth the upgrade. Hey Janice, I figure I'll be alright with my 1000 because I'm gonna get one of those LED kits, hopefully should last 25 years, by which time I'll be 90 and either be unable to even turn the projector on, or dead and won't care anymore. 2017 is Canada's 150th Birthday, exciting year for Canadians. Sounds good Steve...Happy New Year to you too! Janice, I finally ordered and got my LED kit from Myron and it works perfectly. I'm very pleased with it. Thought I should say so followup. Glad the LED kit worked for you Steve. Sounds like your lamp issue is solved. my SANKYO Dualux 1000 just blew the electolytic next to the motor. It is a .05 microF 250 V bipolar, difficult to obtain locally. What does it do? RFI suppression? 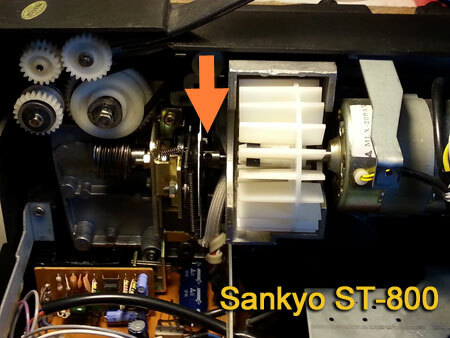 Does anybody have circuit diagram for the Sankyo 1000 projector? Thanks forany help or suggestion! Welcome Hans! To avoid getting too much off the topic of this thread (Adjusting the Claw) and to get more responses you might want to open a new topic. well there was a bit of film inside although that was`nt causing the problem. I tightened the screw on the wheel that takes the film in and it seemed to work the only problem problem is the loop former at the front of the machine eg the piece of thin wire is loose and just goes up & down I can`t see any way of adjusting this so I think I will use it for spares as I have another two of them.